6 July 1944 – Forêt de Croc V-1 Flying Bomb Site Lancaster lll ND460 MG-W (3.05) as Master Bomber. 551 Aircraft – 314 Halifax’s, 210 Lancasters, 26 Mosquitoes, 1 Mustang – Attacked 5 No. V1-Weapon Targets. Only 1 Aircraft was lost, a No.6 Group Halifax from a Raid on Siracourt V1 Flying-bomb Store. Four of the Targets were clear of cloud and were believed to have been Bombed accurately but no results were seen at the Forêt de Croc Launching Site. 222 Aircraft – 168 Halifax’s, 46 Lancasters, 8 Mosquitoes – of No.s 4, 6 & 8 Groups Bombed a Storage Dump at Thiverny but the Target was Cloud-covered and no results were seen. 18 Lancasters & 5 Mosquitos of No.8 Group used Oboe to Bomb the Rollez V1 Launching Site. No Aircraft lost. The Fate of this Aircraft MG-K – On Saturday, 10 June 1944, (a part of) the Aircraft of the 7th Squadron (RCAF), took off for a mission to Scholven Power Station, Gelsenkirchen in Germany from a Station (Airfield) in or near Oakington. One of the Crew members was Flight Sergeant W Parkin RCAF. He departed for his mission at 15:07. He flew with an Avro Lancaster (type III, with Serial PA964 and Code MG-K). His mission and of the other Crew members was planned for Saturday, 10 June 1944. Failed to return. 222 Lancasters & 7 Mosquitoes attacked Railway Marshalling Yards at Chalons sur Marne and Nevers. Both Raids were successful. 3 Aircraft lost, 2 Lancasters from the Nevers raid & 1 Lancaster from Chalons. 942 Aircraft – 667 Lancasters, 260 Halifaxes, 15 Mosquitos – to Bomb 5 Fortified Villages in the Area east of Caen through which British 2nd Army Troops were about to make an Armoured attack, Operation Goodwood. The Raids took place at Dawn in clear conditions. 4 of the Targets were satisfactorily marked by Oboe and, at the Target where Oboe failed, the Master Bomber, Squadron Leader E K Creswell, and other PathfinderCrews used visual methods. American Bombers also attacked these Targets and a total of 6,800 tonnes of Bombs were dropped, of which Bomber Command dropped more than 5,000 tonnes. Elements of 2 German Divisions, the 16th Luftwaffe Field Division & the 21st Panzer Division, were badly affected by the Bombing, the Luftwaffe Division particularly so. Operation Goodwood made a good start. This Raid was either the most useful or one of the most useful of the Operations carried out by Bomber Command in direct support of the Allied Armies. The Aircraft Bombed from medium heights, 5,000-9,000ft, but Army Artillery & Naval Gunfire subdued many of the Flak Batteries and only 6 Aircraft – 5 Halifaxes & 1 Lancaster – were shot down. No German Fighters appeared. Allied Air Superiority over the Battlefield by day was complete. The fate of this Aircraft MG-J, Lost without a trace over English Channel – On Friday, 25 August 1944, (a part of) the Aircraft of the 7th Squadron (RAAF), took off for a Mission to Brest in France from a Station (Airfield) in or near Oakington. One of the Crew members was Flight Sergeant H Stenhouse RAAF. He departed for his Mission at 22:24. He flew with an Avro Lancaster (type III, with serial NE123 and code MG-J). His mission and of the other Crew members was planned for Saturday, 26 August 1944. Pilot’s Comments: Caen Battle Area. A dawn Attack on Enemy Lines. Very heavy Gun Barrage seen below. Bomb load 9000 lbs. A Navigator’s Comments: (Forward Battle Area). Our Bomb load was 13000 lb HE. We took off at dawn & Bombed in Daylight. Our attack was against German Armour and Infantry in a large Cement Works to the East of Caen. I understand that a large number of our Troops (Polish Soldiers) were killed in this Attack as some of the Target Markers went awry. The Bombing was later described as concentrated and very good. Years later, I saw on Television an interview with a German Regimental Commander, and he described this Heavy Bombing, and said ‘My Regiment ceased to exist on that day’. We saw no Fighters. I often felt that the use of a Strategic Bomber Force in close support of Ground Troops was not a correct role. Although more than 1000 Lancasters & Halifax Bombers took part, I believe the same effects, with less danger to our Troops, could have been affected by Rocket-firing Typhoons & Fighter-Bombers. The duration was 3hrs & 45mins. A Mid-Upper Gunner’s comments: Caen, France. Target Troop Concentrations in Front of our Lines. Bomb load 25-500 pounder Anti-Personnel Bombs. Bombed at 6000ft in clear weather. No Flak. This was the 1st real chance to help our Boys in the Front Lines. Trip 3 hrs 50mins. All Aircraft back. Weather – Cloudy, good visibility. The Master Bomber was clearly heard giving his Bombing Instructions. Fairly Heavy Light & Heavy Flak were encountered Over & Before the Target Area. Five Aircraft were seen to be hit in the Target Area and go down, although no Enemy Aircraft were seen. 38 Lancasters were detailed against Troops & Armour East of Caen prior to an Attack by British 2nd Army Troops. They were part of a Force of 667 Lancasters, 260 Halifax’s and 15 Mosquitoes. Weather – En route. Much low cloud over England with thick haze at English Coast – clearing on Channel Crossing. Target. No cloud, excellent visibility. Bomb Load 13,000lbs, 11 x 1,000lb & 4 x 500lb. The 1st successful use of the Technique was on May 6, 1943, at the end of the Tunisia Campaign. Carried out under Sir Arthur Tedder, it was hailed by the Press as Tedder’s Bomb-Carpet (or Tedder’s Carpet). The Bombing was concentrated in a 4 x 3-mile area preparing the way for the 1st Army. This Tactic was later used in many cases in the Normandy Campaign, for example in the Battle for Caen. Flak negligible in the Target Area, but accurate predicted Heavy Flak was encountered leaving the Target Area. No Enemy Fighters were seen. The cover was supplied by 2 Group. Marking & Assessment of the Attack. Marking was by low bursting Red TI’s from H-5 to H-1. Then by Yellow TI’s bursting at 4,000ft leaving a trail of white smoke. Markers were accurate & punctual, except for one which the Master Bomber identified as being 100 yards South. Bombing commenced 1 min early and excellent concentration was achieved. The Aiming Point was soon obscured by Dust & Smoke, but the TI’s were still visible. 12/A W/C J D Nelson, Hit by Heavy Flak outside the Starboard outer Engine, in the Target Area. 12/H P/O J F Murison, Hit by Heavy Flak in the Target Area, punctured Coolant Tank, Cockpit Perspex & Rear Turret Cartridge Chute. 12/N Sgt F B Small, Hydraulic system hit by Light Flak in Target Area. 626/A2 F/O A C Hicks, Hit by Flak. 626/D2 F/O W D Wilson, A live 1,000lb Bomb was found rolling about in the Bomb Doors after leaving the Target. It was Jettisoned. 626/E2 P/O A P Jones, Hit by Flak. 626/S2 F/O A H Wood, Hit by Flak in Bomb Doors & Starboard Wing. The Distinguished Flying Cross or DFC was in the main Awarded to Officers of the RAF, and many members of Bomber Command were awarded this Decoration with its distinctive Diagonal Blue Stripe, 1 of 3 Flying Awards having this distinct style of Ribbon. The DFC could be awarded for a Tour of Operations or an immediate Award for 1 Operation. Made from Silver the Medal did not carry the Recipient’s Number, Rank & Name but was only dated with the year that it was Awarded. A J L Craig Awarded DFC, 21 July 1944 for Services with 7 Squadron. F/Lt Baxter, F/O Berry, F/O Morrison, P/O Bingham, Flt/Sgt Gordon Graham (Nav), Flt/Sgt Richardson, Flt/Sgt Reid – there were normally 2 Navigators in support of a Master Bomber Pilot. Kiel: This was the 1st major Raid on a German City for 2 months. 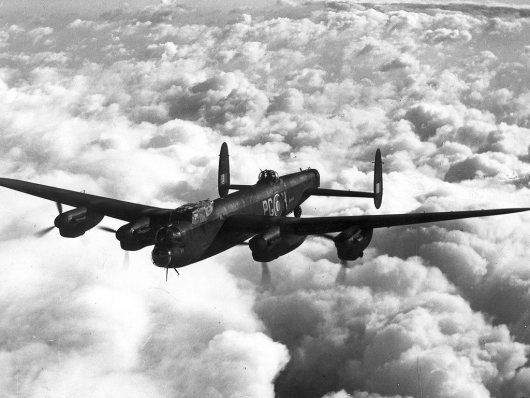 629 Aircraft – 519 Lancasters, 100 Halifax’s, 10 Mosquitoes – were dispatched. The elaborate Deception & Radio Counter Measure Operations combined with the surprise return to a German Target completely confused the German Fighter Force and only 4 Aircraft – all Lancasters – were lost, a rate of 0.6%. The City suffered heavily in this 1st RAF Raid since April 1943 and its Heaviest RAF Raid of the War. The Bombing Force appeared suddenly from behind a Mandrel Jamming Screen (British Electronic Counter Measure Transmitter Type TR1657 Mark XI, operating on 148 MHz to 196 MHz, part of Mandrell III Airborne Radar Jamming System) and the local Radio Warning System only reported it as being a Force of Minelaying Aircraft. The fate of MG-J ~ Lost without a trace over the English Channel – On Friday, 25 August 1944, (a part of) the Aircraft of the 7th squadron (RAAF), took off for a mission to Brest in France from a Station (Airfield) in or near Oakington. One of the Crew members was Flight Sergeant H Stenhouse RAAF. He departed for his Mission at 22:24. He flew with an Avro Lancaster (Type III, with serial NE123 & Code MG-J). His mission and of the other Crew members was planned for Saturday, 26 August 1944. 612 Aircraft then Bombed in a Raid lasting only 25 minutes. All parts of Kiel were hit but the Bombing was particularly Heavy in the Port Areas and all of the important U-boat Yards & Naval Facilities were hit. The presence of around 500 Delayed-action Bombs or unexploded duds caused severe problems for the Rescue & Repair Services. There was no water for 3 days; Trains & Buses did not run for 8 days and there was no Gas for cooking for 3 weeks. Night Raid to Kiel. The Master Bomber 1 was heard speaking to Master Bomber 2 for a while, but about 01.23 hours the Master Bomber 2 took over. Heavy Flak in Barrage form was encountered between 12,000 & 22,000ft. One Aircraft was shot down by a Flak Ship and another 3 seen shot down in the Target Area. One Dornier 217 was seen. The Operation was considered a success and the Flight Plan good. 461 Lancasters & 153 Halifax’s to Stuttgart. 17 Lancasters & 4 Halifax’s lost, 4.6% of the Force. This was the 1st of 3 Heavy Raids on Stuttgart in 5 nights and the only Report available is a composite one for the 3 Raids. The 3 Raids caused the most serious damage of the War in the Central Districts of Stuttgart which, being situated in a Series of narrow Valleys, had eluded Bomber Command for several years. They were now devastated and most of Stuttgart’s Public & Cultural buildings were destroyed. The 2nd of the 3 Raids, on the night of 25/26 July, was the most successful. 494 Lancasters & 2 Mosquitos of No.s 1, 3, 5 & 8 Groups in the last Raid of the current series on Stuttgart. German Fighters intercepted the Bomber Stream while over France on the Outward Flight; there was a bright moon & 39 Lancasters were shot down, 19% of the Force. Attack made at 2000ft Altitude. East of Caumont. Allied Heavy & Medium Bombers & Fighter-Bombers of the 2nd Tactical Air Force supported the Ground Attack, (Operation Bluecoat) although at 1st poor weather severely hampered Air Operations. In addition, the Bocage Landscape comprised numerous small fields bordered by thick & tall hedgerows, between which ran narrow sunken country lanes. The terrain provided excellent cover for the defending German Forces. 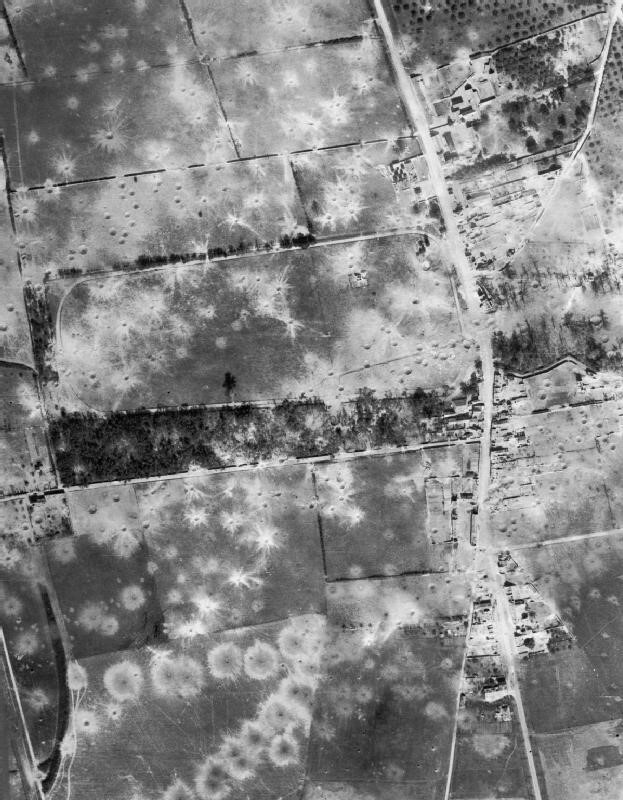 692 Aircraft – 462 Lancasters, 200 Halifax’s, 30 Mosquitoes – were sent to Bomb 6 German positions in front of a mainly American Ground Attack in the Villers Bocage & Caumont Area. The presence of cloud caused many difficulties and only 377 Aircraft were able to Bomb, on to Oboe Markers, and only 2 of the 6 Targets were effectively hit. 4 Lancasters lost. 2 Mosquitos carried out uneventful Ranger Patrols.